Cream cheese, butter, and lots of eggs lend a richness and denseness to this gluten-free pound cake that has a hint of almond flavor. It’s the best pound cake I’ve ever had and is a hit everywhere that I take it! Originally shared May 2013, updated August 2018 as it’s still a favorite that I make often! 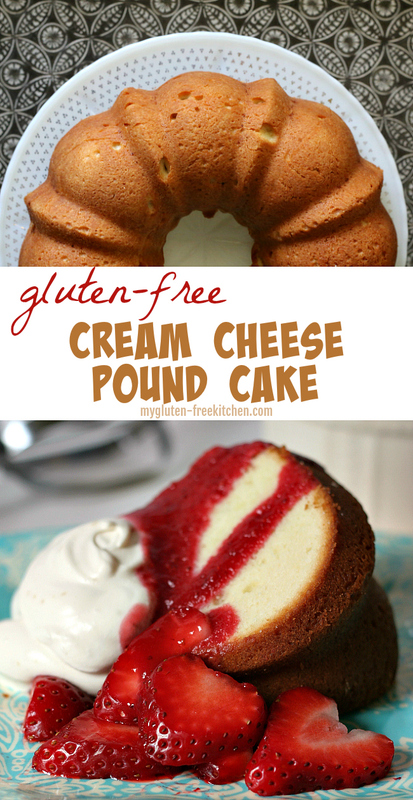 This cream cheese almond pound cake was a favorite around here during the years before I had to go gluten-free. I hadn’t yet tried making it gluten-free because I was intimidated about converting it since the recipe was reliant on cake flour for the perfect texture. Thanks to Joy the Baker’s post on how to make your own cake flour, I was able to use that info and translate that over to my gluten-free adaptation. I also did a little tweaking so that the recipe wouldn’t have super odd measurements and it all worked well. I think you’re going to love this gluten-free pound cake! When we were invited to a friend’s house recently for a game night, I decided I should make this gluten-free pound cake. Halfway through our game night, we paused our intense game of Settlers of Catan so we could all enjoy some of this delicious pound cake with some fresh whipping cream, strawberries and my homemade double-berry sauce. It was incredible! The cake is dense like a pound cake should be, yet very moist, not dry at all. Since achieving success with making this gluten-free pound cake, I’ve made it numerous times since – several times every summer of every year, so we can enjoy it with fresh berries! Cream cheese, butter, and lots of eggs lend a richness & denseness to this cake that you just can’t get otherwise. Sorry to those of you that have to avoid dairy and eggs – this won’t be a good recipe for you. Those ingredients are a huge part of why this recipe turns out so great! Butter: I used salted butter since that seems to be the type of butter most have on hand. If you only have unsalted butter, then I would recommend adding 1/2 tsp. salt in with the dry ingredients. Cream Cheese: I’ve made this with regular cream cheese and I’ve also made this with Neufchâtel (lighter cream cheese) and both work equally well. Almond extract: I use Nielsen-Massey pure almond extract. If you do have a nut allergy to work around, you could definitely omit the almond extract and substitute with either pure lemon extract or more of the pure vanilla extract. All of the extracts from Nielsen-Massey are certified gluten-free, so I recommend them. Eggs. Egg size matters, especially in a recipe like this where you’ll be using 6 eggs. Use large eggs, not medium, not extra large. Just the regular ones labeled large from the grocery store. Gluten-free flour blend: I’ve tested this successfully multiple times with Gluten-free Mama’s Almond Flour Blend and recently with King Arthur Flour Gluten-free Measure for Measure free flour blend. With the King Arthur flour blend, it contains xanthan gum already, so no additional xanthan is needed. Either of these flour blends will yield successful results. I’m sure other flour blends will as well, I just haven’t tested with all of them! Give your favorite blend a try! Corn Starch – Corn starch is essential here as you’re using it to lighten up the total flour amount and achieve the perfect crumb. I recommend buying Argo Corn Starch which is clearly labeled gluten-free or Hodgson Mill corn starch that is certified gluten free, and produced in a dedicated gluten free environment that is also free of the top 8 most common food allergens. I never liked whipping cream until this past year when I was at a friend’s house and she made some homemade whipping cream for me. It was so good and I’ve been making it her way ever since. I just blend (with a hand mixer or in my Blendtec) heavy whipping cream with some powdered sugar and some pure vanilla extract. I really don’t measure, just throw it in and add more sugar and vanilla to taste. The fresh & light taste of the homemade whipped cream went perfectly with the moist, heavy pound cake. 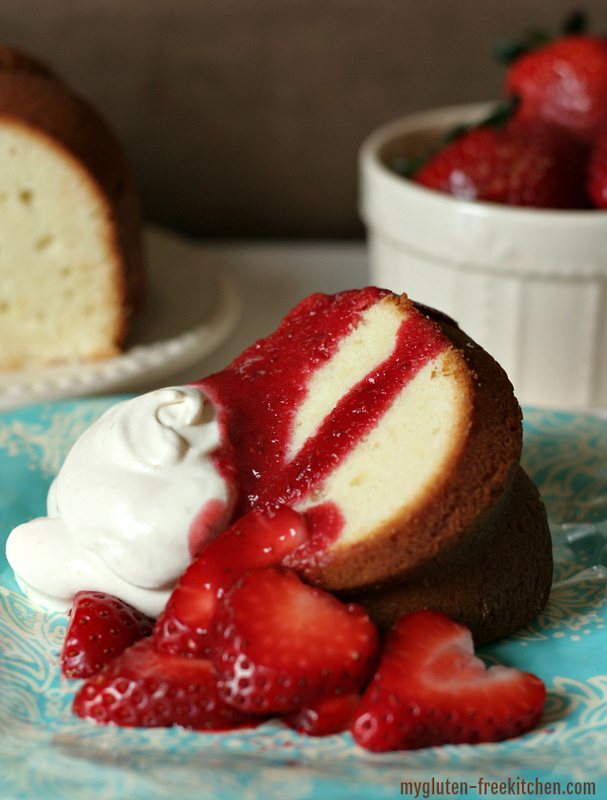 You could also serve this gluten-free pound cake with vanilla ice cream. You can serve with your favorite berries, and I definitely recommend you make my Summer Berry Sauce to pour over it! My hubby liked this dessert so much the first time I made it, he immediately went back for seconds, and he seriously got his plate as clean as possible without licking it! It’s the same way every time I’ve made it since. It’s in his top favorite desserts I make! I also wanted to share that after years of making bundt cakes and being frustrated with how to store them so they don’t dry out, I’ve finally found a solution! 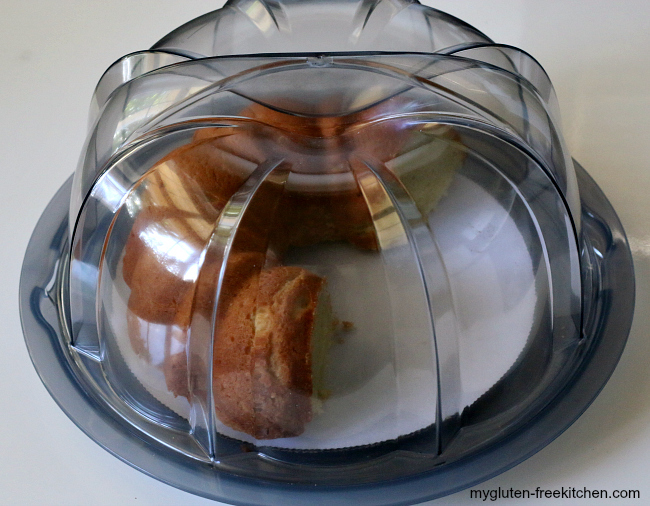 I found this Nordic Ware Deluxe bundt cake keeper and it worked very well for storing this cake. I actually set my cake on a little 9″ cardboard cake round so that I could cut the cake right in there too without scratching up the surface, or easily move it in/out of the keeper if I wanted to. I’ll be using this for my bundt cakes all the time now! Also, the bundt cake that I use for this and pretty much all of my bundt cake recipes is about 10″ across by about 3.5″ tall/deep. It can hold 12 cups. It’s this one from Nordic Ware. Want to make some other bundt cakes? They’re my favorite kinds of cakes to make because they’re so easy! 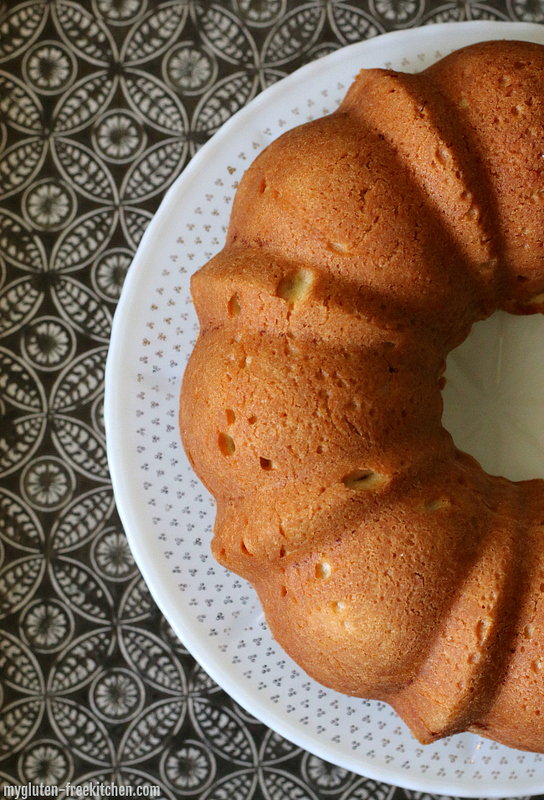 I recommend trying my gluten-free fresh apple cake next in your bundt pan, as soon as apple season hits! It’s another one of those recipes I make over and over and has a dairy-free option too. Also dairy-free is my gluten-free lemon coconut bundt cake. My friend Megan made this gluten-free blueberry lemon bundt cake that looks so good! And I’d love to try this gluten-free orange-cranberry cake from my friend Cindy. 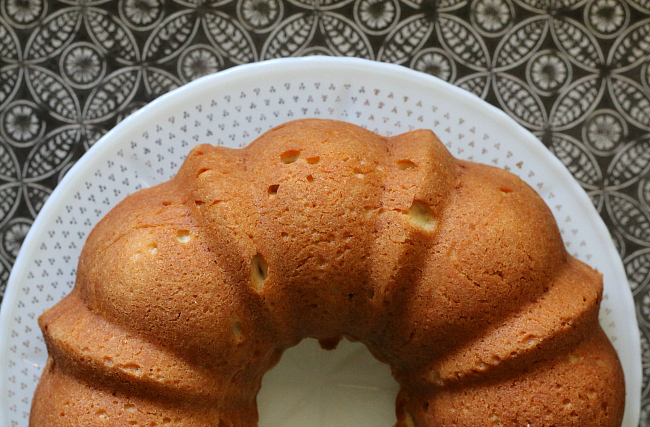 I hope you’ll make and enjoy this pound cake recipe! Read through the comments if you’d like to make mini pound cakes, as some other readers have tried that! 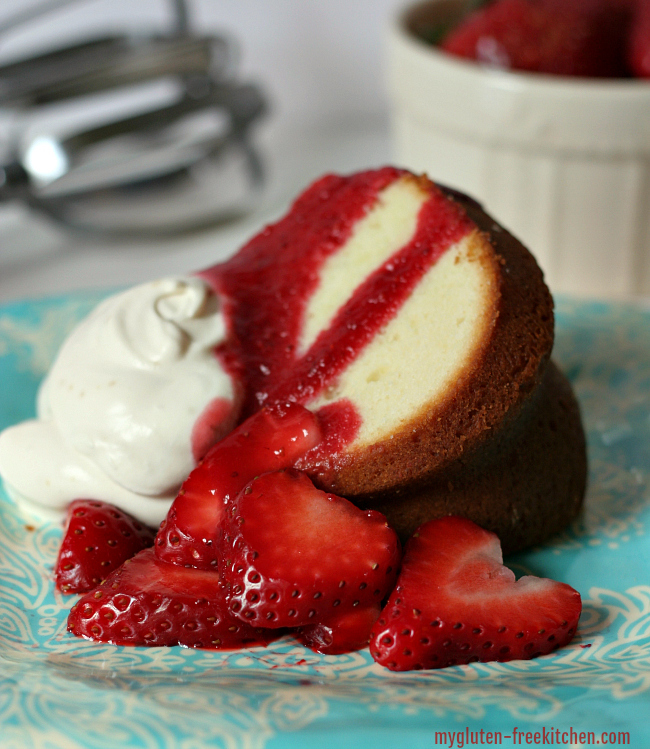 A flavorful, moist, dense gluten-free pound cake, best served with fresh whipped cream or ice cream, and fresh berries. Preheat oven to 325°. Spray a bundt pan or 2 loaf pans with non-stick cooking spray. In the bowl of your electric mixer, cream together the butter, cream cheese and sugar until light (medium speed -about 5 minutes). Add the vanilla and almond extracts and beat another 30 seconds to mix well. Place a sifter/sieve/strainer over a medium-sized bowl. Measure the gluten-free flour, cornstarch, and xanthan gum, and dump into the sifter. Sift together the dry ingredients. You can repeat to sift another time or I just used a whisk and really whisked them together well after the first time sifting. Break the 6 large eggs into another bowl and set aside. With your mixer on low, alternately add the flour mixture and the eggs to your butter/sugar mixture, beginning and ending with the flour mixture. Mix just until mixture is uniform with no streaks of egg or flour. Bake at 325° for 1 hour and 15 minutes or until toothpick inserted in the center comes out clean. Allow to cool in pan, then gently loosen the sides with a table knife or plastic spatula before turning over onto serving plate. While I've tested this with and recommend using either Gluten-free Mama's Almond Blend or King Arthur Flour's Measure for Measure gluten-free flour, feel free to try this with your preferred quality gluten-free flour blend. If your flour blend contains xanthan gum or guar gum, then omit the xanthan gum called for in my recipe. See blog post for substitutions and recommended ingredients. Oh my goodness, Michelle!! If I could have dairy I would so make this! YUM! It looks absolutely divine!! Thanks Megan for stopping by and commenting! I’m sorry you can’t enjoy this, but from the looks of your blog, you have lots of other yummies! I do try to post dairy-free adaptations whenever available on my recipe since I know many people have to be both gluten-free and dairy-free. This is for Megan. I have not tried this particular recipe, because of all the eggs (I am allergic to the whites), but you can substitute dairy free margarine for the butter and Tofutti Better Than Cream Cheese for the cream cheese. Hope this helps. Thanks so much for those tips! I appreciate you taking the time to comment to help out those that can’t have dairy. Can’t wait to try this 🙂 My brother went gluten free because of his Crohn’s disease and he’d love this. Could you substitute coconut flour blend for the almond blend? My daughter is allergic to nuts. This looks delicious!!! And the only whip cream I ever eat now is homemade. Soooo good & fresh! Karolyn, Mama’s Coconut blend should work just as well here! Enjoy!! I have this recipe in the oven right now and it seems to be getting really brown on top, I almost think the top might get too dark. I will let you know. I also added lemon instead if almond, I can’t wait to try it! I made this and it was outstanding! I added pecans and maraschino cherries for an Xmas flare! The flour blend I used was 2 cups rice flour, two-thirds cup potato flour and one-third cup corn starch. I baked it for just under 60 mins. It was heaven… thank you! This is my first time baking a gluten-free product for a friend and it turned out great. I would highly recommend this recipe. While it wasn’t for me, I tasted it was was pleasantly surprised at how good it taste. Yummy! I so loved this. Everything about it was awesome I didn’t change a thing , made the summer berry sauce, and the whipped topping . I loved it . !!!!! Has anyone tried the recipe with a sugar substitution, like honey or agave? Hi! Do you have a gluten free recipe for a Caramel cake? Yum! I want to make it for my birthday! Thanks! Hi I have made this a number of times and it is so delicious. I have a mini bunt pan that makes six single bunt cakes. Could this recipe be used in it? If so would the baking time be the same or would I need to change it and what would you suggest? Thanks for the help!! Made this yesterday as written (including using gluten free mama almond blend flour), except that I made it for a gluten free friend who also avoids lactose, so I subbed in toffutti cream cheese for the regular (used regular butter though, as it’s very low lactose). It was AMAZING. I used it (cut into cubes) in a blueberry, raspberry trifle layered with coconut whipped cream (again, to avoid lactose) mixed with homemade lemon curd. She reported to me that it was easily the most amazing dessert she’s ever had. Woohoo! Fortunately for MY family, I made multiple mini pound cakes and had several leftover to keep for them. I have had a piece with blueberries and whipped cream, a piece with raspberries and whipped cream, and now a piece with nutella on it. Each one was fabulous. This is a real winner of a recipe, and were it not for the sifting with a sieve, it would take about ten minutes to make! Nice job! We made this tonight – it is a wonderfully light and tasty pound cake – thank you for the recipe! Has anyone tried this using a gluten free all purpose flour? I made this for dad’s birthday (who is not gluten free) and everyone LOVED it! I will definitely be making this again. And it was so easy to make! Thanks! Clearly did something wrong. Looked great when I took it out of the oven. As it cooled, it collapsed. It appears wet inside, though baked as directed. Tastes okay, just appears way too moist. Going to see what it tastes/looks like tomorrow. Bummer. If it is still wet inside, then it needed more cooking time. Pan sizes can vary as well as oven temperatures, so that’s why I include along with the baking time, the reminder check for doneness when a toothpick inserted in the center comes out clean. Try that next time and it should be perfect! OMG! This is great! Instead of almond extract, I used lemon juice and lemon zest in the batter! Yay and I love that substitution! !